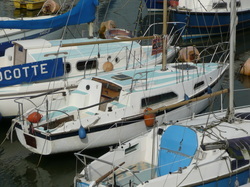 A few years ago, I bought a Vivacity 650 yacht and named her Antibes. She was built in the early 70's before the oil crisis, when fibre glass manufacturing was a whole cheaper than it is today. As a consequence the hull thickness is more substantial than modern fibreglass hulls - at least that is what I was told! The 650 means that she is 6.5m LOA or 21ft in imperial. So sometimes they are called Vivacity 21 or Vivacity 650. There are other models the Vivacity 20 and 24, but the 21/650 looks very different and in my opinion much 'nicer'. 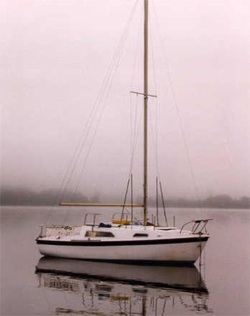 It is a great boat, 4 berths, galley, heads and a good size cockpit with the main sheet near the rudder rather than mid cockpit. There is also a water tank! The only downside from my point of view is that the Headroom is limited.I have only had 3 people sleep on board and that was a tight fit! So 4 would be very friendly... In car terms she would probably be a 2+2 . i.e. 2 adults most of the time with an occasional 2 more, or more comfortably 2 adults and 2 children. When we moved to Jersey I sailed it across (on the back of the Condor Ferry), and she is now in the old Jersey harbour on a drying mooring. 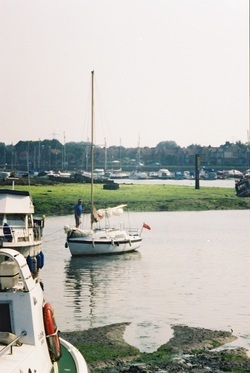 It used to take me 2.5 hours to get to the Fareham harbour, it now takes me 15 minutes - sadly though parking there is not that easy so I probably only go as often as I used to when I lived far away - which wasn't very often! 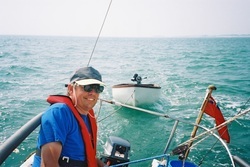 Have a look at the sailing links to find out more about these excellent boats, they sometimes come up for sale on ebay and sell for around £1500, you get a lot of boat for that! 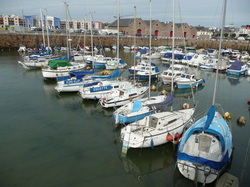 Close up of mooring in St Helier old harbour. The old harbour St helier - lowish tide. Antibes when she was in the lakes and known as Dasumar.